The majestic Tritons Square proved a fitting backdrop for the awards ceremony of the Malta Fashion Week and Awards 2018. 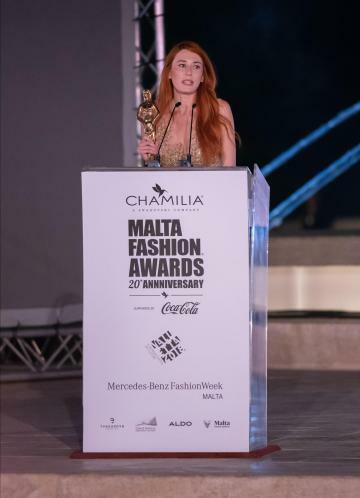 Now in its 20th year, the annual event ended with the Chamila Malta Fashion Awards. Malcom Gauci was named the year’s best stylist, with Madeleine Baldacchino and Robert Agius scooping up awards for best female and male photo model respectively (see full list of winners below). CEO and Fashion Awards founder Adrian J Mizzi received an Outstanding Achievement Award from Times of Malta journalist Vanessa MacDonald, who 20 years ago had written with scepticism about the award ceremony’s future prospects. The theme of the night was memories, with a timeline set up alongside the red carpet with photos shot throughout the years. The night also featured different presenters who had each presented the show at some point over the years. Awards were presented by iconic people within the local fashion industry. The night featured a catwalk show with outfits from stores found at The Point, a small showcase of local designers and hair shows by Chris Galea, Neville Roman Zammit, Flavia Borg Attard and Vanusia Mifsud Vella. Ira Losco also performed live and sang One in A Million.